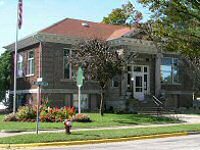 The Bronson Branch Library is now a central hub of community activity in Bronson. The library boasts a large children's area; books magazines, and videos; computers for public use; and a microfilm collection of the Bronson newspaper. During the summer, and throughout the year, the library is abuzz with a variety of programming for our patrons. The Bronson Public Library is a registered Michigan Historic Site.